Get your spring sales season off to a start with the Rancho “Wheel ’n & Deal ‘n” Offer, featuring so many choices, you won’t be able to pass it up! With Visa Prepaid Card offers up to $400, Rancho delivers the right performance ride control and suspension technology products for your Vehicle applications. The Rancho “Wheel ’n & Deal ‘n” Offer rewards valuable Visa Prepaid Cards for qualifying purchases from Rancho’s complete performance ride control and suspension technology lineup. Qualifying Products include: RS6444, RS6501, RS6503, RS6504, RS6506, RS6507, RS6507B, RS6509, RS6509B, RS6510B, RS6511B, RS6514, RS6514B, RS6515B, RS6517, RS6517B, RS6518B, RS6519B, RS6524B, RS6525B, RS6545B, RS6547B, RS6548, RS6548B, RS6550B, RS6551B, RS6554B, RS6556B, RS6557B, RS6558B, RS6559B, RS6564B, RS6569B, RS6573B, RS6577B, RS6578B, RS6579B, RS6581B, RS6582B, RS6583B, RS6584B, RS6585B, RS6587B, RS6589B, RS6592, RS6593, RS6594B, RS66000, RS66001, RS66102B, RS66103, RS66103B, RS66104, RS66104B, RS66105, RS66105B, RS66106B, RS66107, RS66107B, RS66400B, and RS66901R9. Qualifying Shocks Include: RS99901 – RS999944, RS999700, RS999800, RS999000, RS7000, and RS5000. 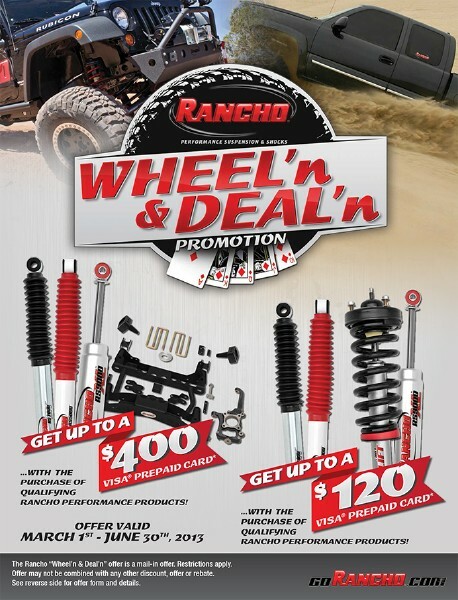 The Rancho “Wheel ’n & Deal ‘n” Offer is a mail-in offer. For each qualifying purchase referenced, you receive the specified Visa Prepaid Card Value. Offer is valid only for qualifying products. Upon fulfillment of offer requirements, Tenneco will forward consumer a Visa Prepaid Card in the amount for which consumer is eligible through qualifying product purchases. 1.Authentic dated sales receipt (copy or original) with business identification verifying the purchase of the qualifying products. The purchased product part numbers must be identified on the sales receipt. Qualifying purchase amount does not include installation, Labor costs, or taxes, and offer is good only on qualifying products. Offer does not apply to transactions when product is being placed under warranty. 2.Consumer offer form, filled out completely and legibly. Visibly altered documentation will not be honored. Consumer remits completed offer form and required proof-of-purchase (dated sales receipt) to “Wheel’ n & Deal’ n” headquarters. Offer submission must be postmarked by August 1, 2013. Tenneco is not responsible for late, lost or misdirected mail. All proofs-of-purchase become the property of Tenneco, and will not be returned. Consumers should retain copies for their files. Offer valid only in the U.S.A. Offer open to individuals; requests from groups, clubs or organizations will not be honored. Void where prohibited, taxed or otherwise restricted. Consumer should allow 8-10 weeks for processing of paperwork and delivery of Visa Prepaid Card from receipt of offer form and required proof-of-purchase. Fraudulent submission could result in federal prosecution under mail fraud statutes. Purchase , sale or trade of any offer requirement is prohibited. This is a mail-in offer. Restrictions apply. Offer may not be combined with any other discount, offer or rebate. Offer limited to one (1) household. Please contact your Automotive Customizers representative with additional offer questions.